If you are a cloth-diapering mama, you probably know that a wetbag is a necessity, especially if you plan to cloth diaper when you go out as well as at home. But even non-CDing parents will benefit from a wet bag. Whose kid hasn’t had a massive blowout or some other “accident” while out and about? You can put the bag in your diaper bag and the rest of it won’t get contaminated with nasty smells and wetness. 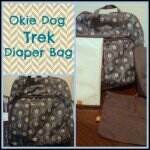 Or if you prefer, use it as your diaper bag, since it has a nice little handle. Wash it when you get home. This bag has been extremely useful for us. We have one completely in diapers and one who is mostly potty-trained, but has quite a few “accidents.” Last week N had a massive “blowout” while we were away from home. Once we finally got him cleaned up, we were able to lock the dirtiness safely away in the wet compartment and didn’t smell it anymore, until it was time to remove and wash it. Boy did it smell then! Planet Wise has a great selection of eco-friendly items for baby and the rest of your family! They have wet bags, cloth wipes, nursing covers, snack bags, sport bags and more! I received one or more of the products mentioned above for free for evaluation purposes. However, all opinions expressed are still 100% my own. I am disclosing this in accordance with the Federal Trade Commissions 16, CFR part 255 Guides Concerning the Use of Endorsements and Testimonials in Advertising. Please see my full disclosure policy HERE. Save $2 on the Camp Combo at Mabel’s Labels!